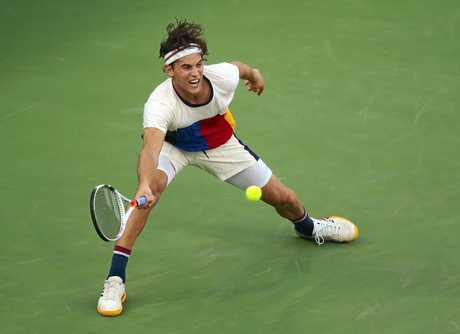 FORMER US Open winner Juan Martin del Potro has fought back to win an extraordinary five-set match against rising Austrian star Dominic Thiem and surge into the US Open quarter-finals. Down two sets and looking down and out, the Argentinian recovered to sweep through the third set. But he again looked in dire straights, down 5-2 in the fourth, before rallying to take the tie-breaker in dominant fashion. The crowd favourite then held on to take the fifth set and bank a remarkable 1-6 2-6 6-1 7-6 (7-1) 6-4 victory. Respected Australian tennis coach Darren Cahill, who has worked with Lleyton Hewitt, Andy Murray and Andre Agassi, described del Porto's victory as "the greatest comeback I've ever seen" while commentating for ESPN. Del Potro will next face five-time champion Roger Federer in the quarter-finals. Del Potro revealed he battled illness in the lead-up to the match, and certainly looked sluggish as can be at the outset, dropping the opening two sets with little resistance. "Oh my God," Del Potro told the crowd. "I was sick the last two days. I came here trying to play the best I can and then when I see this crowd cheering for me, I was trying to play better every game. I think I fight like this because of you guys so thank you very much." Del Potro then trailed by a big margin in the fourth set, even facing two match points. Still, del Potro never gave in or gave up, eventually working his way all the way back on the strength of powerful serves and thunderous forehands to edge Thiem in more than three-and-a-half hours and reach the quarter-finals. "Thanks so much for all the support you gave," del Potro told the boisterous Grandstand crowd that regaled the 24th-seeded Argentine with "Ole!" chants. "It helped me a lot. ... I won't forget this match."